A master of illusion, Mysterio seeks universal fame as a cloaked villain with an unmistakeable helmet. Easily the most difficult figure to find in Spider-Man Legends Series 6 is Mysterio. No offense to Gwenpool, but if you're going to put a seven-figure series in an eight-figure case, and you've got a classic villain who's getting his first figure in 13 years and is going to be in the next movie, why would you not make that the figure that gets doubled up in every case? One of everybody, plus an extra Mysterio for the people who don't care about Build-A-Figures. Everyone wins! 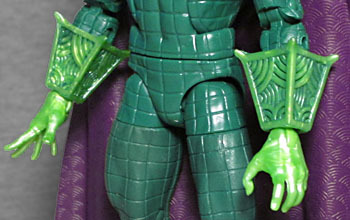 Perhaps the reason Hasbro didn't do that is the expense of the molds: Mysterio is one of these rare modern action figures that doesn't have any reused parts. Any. Even if his body were the same size as someone else's, he's got that checkerboard pattern covering the entirety of his suit. Yes, Hasbro might find someone to reuse this mold later (don't ask us who, though), but for now it's a unique piece and would have been expensive to make. [Though wouldn't immediately using it for twice as much stock have helped defray that cost? --ed.] The weird swirly patterns on his gloves have a deep sculpt, and there's a whole subtle texture on the inside of his cape. 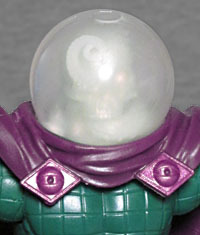 When ToyBiz made a Mysterio, they messed up the design of the helmet - to accommodate an action feature, it ended up the wrong color and the wrong shape. 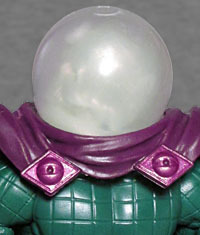 On their Marvel Universe figure, Hasbro proved they didn't need to repeat those mistakes, and they haven't now that they're working in the 6" scale: Mysterio's dome is a light, foggy, white ball, just as it should be. Though perhaps it's a bit too light. Like the previous Mysterios, this one does have a head under the glass dome; but the helmet is so translucent, you can make out the details way too easily; it should be a head-shaped shadow, not a head. The problem gets even worse depending on which variation you get: I was lucky enough to snag the one where the head is molded in white, but there are also ones out there where it's molded in the same green as the accessories, and that one is just blatant in its visibility. Whichever color it is, the head has the same sculpt, and it's not human. Rather, the head depicts Mysterio using his powers to create something unsettling - it's a bare skull with a tentacle coming out of one eye socket, and another emerging from the mouth and wrapping around the back of his neck. That definitely beats a plain Quentin Beck head, and is absolutely the kind of thing he'd choose to make his opponents see, but that doesn't mean we should be able to see it through the helmet. You know how police will heat up superglue and use the fumes to find fingerprints? Wonder how well that would work to make the interior of the fishbowl more opaque. For now, we've found that twisting the head to look backward over the right shoulder is the best way to make the helmet look full without having anything recognizable within. 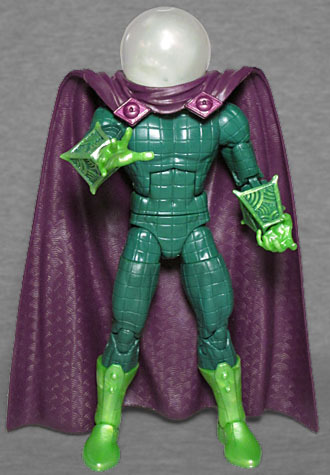 Mysterio has all the usual articulation - head, neck, shoulders, biceps, elbows, wrists, chest, waist, hips, thighs, knees, boots, and ankles - but his cape hangs so low that the most extreme poaes are off the table (unless you find a way to raise him up). His accessories are two translucent green special effects, bundles of smoke and tentacles that clip onto his shins, like he's emerging from a cloud of eldrich horror. They're pretty awesome pieces! 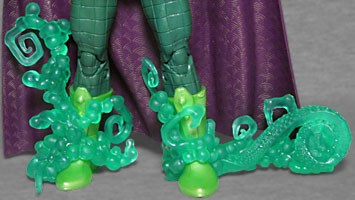 The figure also includes the left leg of the Series 6 Build-A-Figure, the Lizard. The spoopy head is a fun piece (you know what would have really rocked, though? Glow-in-the-dark plastic! ), but it might have worked better as an alternate. Take a cue from the 4" figure and include an unpainted Chameleon head as the standard, perhaps? Or just do a better job lining the inside of the fishbowl. But even with those complaints, there's a very good reason that this figure is so hard to find; it's a classic villain in his classic costume, with some well-designed accessories and no action features weighing him down. Get it if you can, because if you pass up on it once you may never see it again.